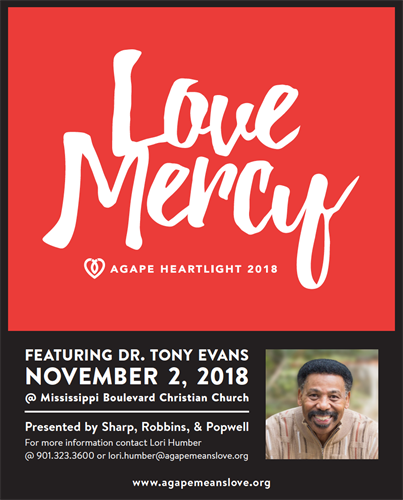 EVENT DETAILS: Join us for Agape HeartLight at Mississippi Boulevard Christian Church on Friday, November 2, presented by Sharp, Robbins and Popwell. This year’s event features Dr. Tony Evans, pastor, best-selling author and host of popular radio broadcast The Alternative. Together, we’ll explore what it means to "Love Mercy" and support families in need in Memphis’ most under-resourced neighborhoods. This event supports Agape Child & Family Services and its mission to keep local families safe, smart and successful. ABOUT AGAPE: Agape Child & Family Services is a faith-based, non-profit organization dedicated to providing children and families in Memphis with healthy homes. Agape serves nearly 8,000 children and families each year in an effort to keep them safe, smart and successful through school-based initiatives and site-based services in under-resourced communities; counseling; homeless services; adoption and foster care. In partnership with the Tennessee Department of Human Services, Agape and its community partners have expanded services via a two-generation model, wholly serving youth and parents in a poverty-reduction strategy, providing support, permanency, and sustainability in Frayser, Hickory Hill and Whitehaven. To learn more, call 901.323.3600 or visit www.agapemeanslove.org.